Our client wanted an aircraft that stood out among other aircraft. I believe we achieved that goal. What do you think? The paint products used for the two-tone aesthetic of the project were two primary systems: Sherwin Williams satin black base with satin clear coat and Axalta Chromalusion’s “color changing” base coat color called Perfect Jade followed by a gloss clear coat. See a time-lapse video of this beautiful paint project below. Duncan Aviation works with a variety of customers. The majority use their aircraft for business purposes, some have personal aircraft and a small portion are pilots themselves. A very select group fit all three categories. When a customer came to Duncan Aviation's Battle Creek facility with a Dassault Falcon 50EX, his mission was to leave with the best upgrades in the cabin, as well as the flight deck. "Our customer dubbed the Falcon a Time Machine, and wanted to ensure this time saver was the most comfortable and efficient tool to get from point A to point B," says Completions Sales Rep Nate Darlington, confirming that the creative tail number M-CFLY was, in fact, a Back to the Future time-traveler movie reference. After completing a pre-buy inspection through Duncan Aviation, the aircraft went directly into an airframe inspection, complete interior refurbishment, complete aircraft paint refurbishment, Cabin Management System (CMS) installation and flight deck upgrades. Read more about the completed Time Machine in the Spring 2015 issue of the Duncan Debrief. The challenge: Paint Virgin's Galactic Girl. The solution: Our team partnered with artist, John Stahr, to airbrush the well-known logo. When a customer comes to Duncan Aviation with a unique request, we make it happen. Watch the process in just a minute and a half. 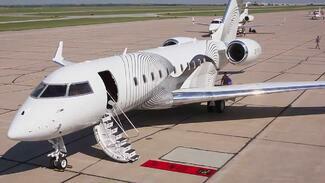 Ever wonder what happens during the first few days your business jet is in getting a new exterior paint? During the earliest stage of the repainting process the aircraft is prepared for the existing paint to be removed. After all composites and other areas on the aircraft are protected, a yellowish peroxide-based stripper is applied and then the paint just begins falling off. To the casual observer, your jet appears to be sitting around waiting with very little activity. But in reality quite a lot is happening. You just have to be patient and wait…and watch…a long time…nearly two days. But don’t blink, you could miss something. Seriously, unless you have time to hang out for a weekend at a Duncan Aviation paint facility, you’ll just have to take my word that paint stripping magic is happening. After a quick scrub, second application and a rinse to neutralize the stripper, all of the protective taping is removed and your aircraft is ready for the next step towards its new look. Over this past weekend we captured a Citation 560 Excel at our Lincoln Nebraska, facility as it began the paint-stripping process. We shortened and sped up this two-day event into a 60 second video. But don’t blink; you still could miss something. When it comes to aircraft paint, the products and processes are constantly changing and improving. To keep up with trends, industry representatives recently collaborated, sharing ideas and solutions at the first-ever Industry Benchmark Forum: Aircraft Paint. That expertise is now available in a customer-focused document at http://www.DuncanAviation.aero/fieldguides/aircraftpaint. Paint industry representatives from Bombardier Learjet, Dassault Falcon Jet, Duncan Aviation, Gulfstream, Elliott Aviation and Standard Aero gathered to discuss the current state of the aircraft paint industry, the processes and products currently being utilized to minimize and mitigate corrosion’s negative impact on aircraft, as well as tour Duncan Aviation’s paint facilities. In an effort to collectively raise the industry benchmark, reduce corrosion and improve painter safety, a group of industry aircraft paint experts gathered to share tips and tricks of the trade. The group also considered current and future work processes and paint products in an attempt to collaborate and find paint systems that are best for customers’ aircraft, as well as paint technicians and team members. Chrome-free paint product expert Tom Chubb of AkzoNobel gave a presentation on the research and rigorous testing process of products currently available and those that might hit the market in the next few years. All the attendees agreed the forum was mutually beneficial for the paint managers, shops and customers. The group will meet again in April at another location to continue to build on this collective knowledge. Download your copy of the Aircraft Paint Customer Guide now. Duncan Aviation takes the long-term approach when it comes to investing in the company, and it has paid off more than 250 times in the paint shop alone.Two years ago, the Lincoln, Nebraska, team celebrated the opening of a 45,000-square-foot aircraft paint facility after observing the current customer base’s shift toward larger aircraft and anticipating that trend had staying power. The paint team saw an influx of Gulfstream 550s, Dassault Falcon 7Xs and other long-range business jets immediately fill the paint schedule. With 150 paint team members between the Lincoln and Battle Creek, Michigan, facilities, they’ve built quite the reputation for themselves, and with nearly 4,500 paint deliveries during the past few decades, it’s no wonder. “We make most any paint request a reality and the paint teams really take pride in their work. They make sure it’s done right the first time, and that’s what keeps people returning,” says Bohac. Customers are coming back, and they’re providing rave reviews. The Lincoln paint team recently completed one of the most complicated paint schemes on one of the largest jets to grace the facility. It took some creative thinking on the part of the design team and several weeks, but Nataly and Ernst Langner, owners and pilots of the jet, were ecstatic. 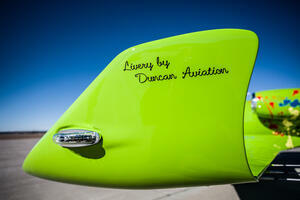 “Duncan Aviation is producing a quality I’ve never seen in the industry. This is the best job I have seen in 50 years,” says Ernst Langner. View the paint team in action on the Langer’s jet. View a timelapse video of Robert Duncan’s creative lime green, paint splattered M2 paint process. A paint refurbishment can completely transform and revive an aircraft, but this update comes with a downtime of several weeks and a hefty price tag. Although many of the customer projects Duncan Aviation delivers don’t necessarily lend well to generic FAQs, a general pattern of questions do emerge from prospects looking to have their aircraft repainted. HOW OFTEN DO I NEED TO REPAINT MY AIRCRAFT? The simple answer is once every five-to-six years - if you hangar your aircraft and wash it frequently. Try to avoid flying near to saltwater or snow where de-icing products are used. Inspect for chips on a regular basis, and stay current on your touch-ups. If you can stick to those rules of thumb, then you can maximize the life of your aircraft paint work. Of course, the above pointers are pretty unrealistic for most business aircraft operators - so, if you’re looking to avoid even more expensive corrosion issues you should take your aircraft in for a full paint refurbishment every half-decade. An ideal time to repaint your aircraft is during a major maintenance event. For example, we recommend Falcon owners sync a strip and paint with their major C-maintenance event, which occurs every six years. WHAT'S INCLUDED IN A PAINT JOB? “Anyone can shoot a glossy coat of paint,” says Completions Sales Representative George Bajo, “but the value is in the details and proven processes. The attention to detail at the sealed windows and cleanliness of the painted landing gear are evidence of a job done right. New stair treads; dressed boots; wiped down wheels and wheel wells; painting inside of gear doors; radome boots that don’t yellow; and erosion tape are extras that customers should expect as a part of the service. A team member helps prep a Gulfstream GV in Duncan Aviation's Lincoln, Nebraska, facility. View time-lapse video. Want to learn more about the futrue of paint refurbishment? 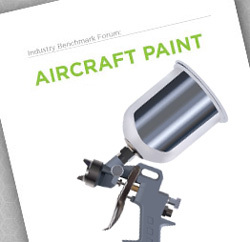 Download our free Chrome-Free Aircraft Paint Systems Field Guide. Watch an incredible time-lapse video of a Duncan Aviation paint refurbishment on a Bombardier Global 5000. How about this time-lapse video of a lime-gree M2 livery? 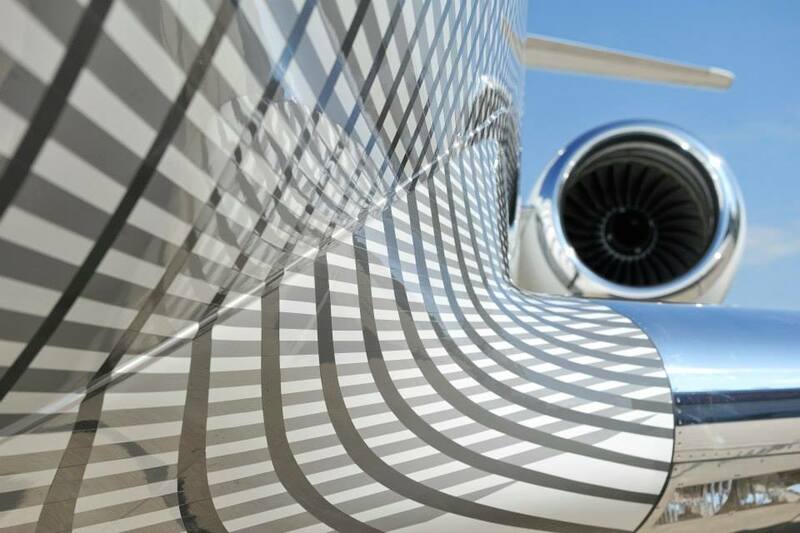 Aircraft paint can beautifully reflect hours of painstaking care and preparation—or it can cover a multitude of sins. The trouble is, you can’t always tell which applies to your aircraft until long after the job is finished. The attention to detail at the sealed windows and cleanliness of the painted landing gear are also evidence of a job done right. New stair treads, dressed boots, wiped down wheels and wheel wells, painting inside of gear doors, radome boots that don’t yellow and erosion tape are also extras that customers should expect. To help aircraft owners identify a quality paint job and decide when to take an aircraft in for a touchup or full repaint, Duncan Aviation industry experts answer questions about pressing paint maintenance issues in the recently updated “More Than Skin Deep: Paint Maintenance and Turbine Aircraft Value” field guide. This field guide explores routine maintenance and turbine aircraft market value, paint processes, and criteria to consider when selecting an aircraft paint service provider. How Long Does Aircraft Paint Last? Duncan Aviation's field guides address topics of importance to business aircraft operators around the globe and are written by our very own technical experts. These documents are available as free PDF downloads. 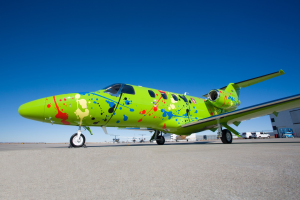 Duncan Aviation researched and tested “green” paint processes for several years, and by 2011 all aircraft painted at Duncan Aviation’s facilities were using an FAA approved, chrome-free paint process. The company is not the first business aircraft maintenance, repair and overhaul service provider to make the transition, nor will it be the last. Duncan Aviation's Chrome-Free Field Guide provides an assessment of market drivers, product performance, application processes and considerations for selecting a service provider. The economic and operational advantages of a chrome-free paint process are considerable. Although chrome-free paint systems provide effective corrosion protection for aircraft, proper application is critical. Vigilance is key when assessing a paint proposal and evaluating the experience and capabilities of a service provider. 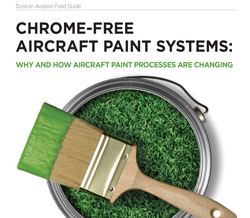 Duncan Aviation recently updated and re-released its field guide, “Chrome-Free Aircraft Paint Systems.” The guide answers how and why aircraft paint processes are changing, what to look for when considering a provider, performance of these new products and waste disposal methods. Duncan Aviation has published several field guides that are available on its website. These guides, written by Duncan Aviation's industry experts, serve to answer questions and address pressing issues for business aircraft operators on a variety of topics. You can download and register for field guide updates at www.DuncanAviation.aero/fieldguides.